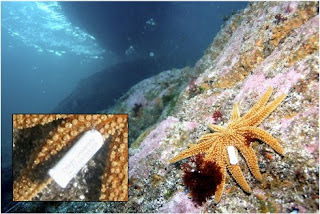 The Echinoblog: Putting Tags on Starfish! Where do they go? What do they do? How fast do they do it? Putting Tags on Starfish! Where do they go? What do they do? How fast do they do it? 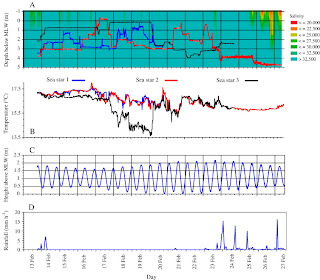 This week-a neat paper from Miles Lamare and team (who are mostly from the University of Otago in Dunedin, New Zealand) about using electronic tagging to study individual movement in the temperate-water New Zealand asteriid starfish Coscinasterias muricata in a 2009 issue of the Journal of Experimental Marine Biology and Ecology (click here). As much as the idea of tagging echinoderms has come up (and this is actually one of the most common professional inquiries I receive) its not been done very much. But technology has progressed and the authors introduce the usage of this handy little electronic tag (the DST-milli electronic tag) made by Star-Oddi. The tag is programmed with electronics that record water temperature, and depth every 5 minutes. Figure 1 from Lamare et al. They tested the behavior of the species and essentially, their findings indicated that there were no apparent behavioral changes in feeding and etc. 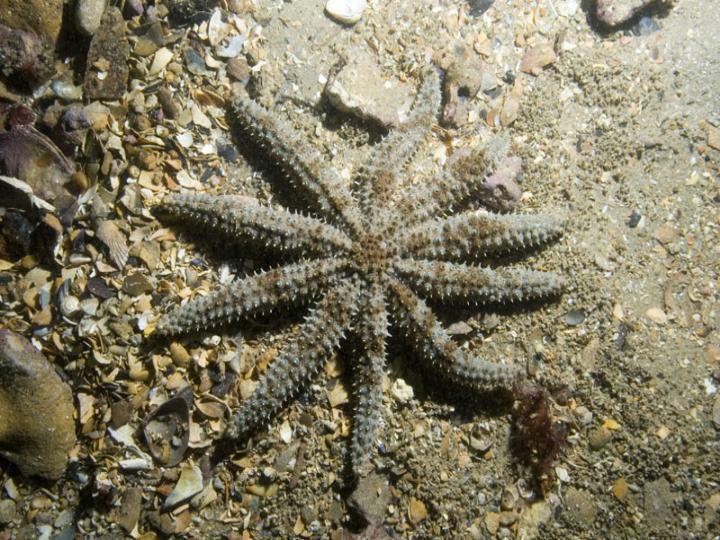 So, as it turns out Coscinasterias muricata is fast. Individuals vary-but on average they seem to be capable of 15.6 meters/day. And that's MUCH faster compared to The Crown-of-Thorns (Acanthaster planci) which can go 2.3 to 4.3 m/day versus the much smaller and slower asterinids (i.e., bat stars) Patiria pectinifera (1.5 to 3.7 meters/day) and Patiriella regularis (5.7 meters per day). We see from the data above that different individuals of this species can travel quite a bit and over a pretty broad vertical distance (four to 14 meters). So, what's going on? It turns out that C. muricata displays "vertical migration" which is to say that it TRAVELS back and forth from deeper to shallower regions in order to forage for its favorite food, the blue mussel, Mytilus galloprovincialis, which live in the intertidal. Their direct observations showed that of the ndividuals observed, 92% of these were present in water LESS than 1.0 meter! with fewer and fewer numbers being present throughout deeper adjacent regions. But based on the tracking info, two of the individuals showed some variation. 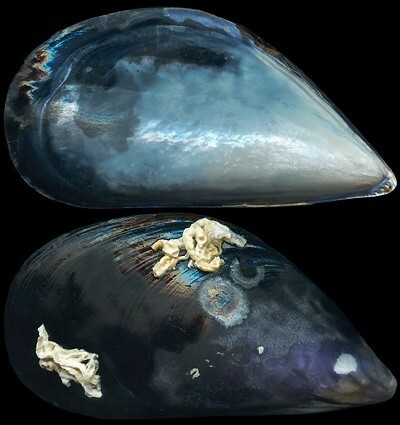 One occupied deeper water below the mussels and then migrated into shallow water for short periods of less than a day and at intervals of about five days. Another occupied shallow depths for the first week before moving on to deeper depths. Another important behavior they noticed was how physical factors, such as salinity affected the behavior of the observed individuals. As a species, Coscinasterias muricata is VERY intolerant of low salinity and experiments suggest that individuals WILL die in a relatively short period if salinity is not maintained. So, if there's freshwater runoff or a storm-it will retreat from shallow water. 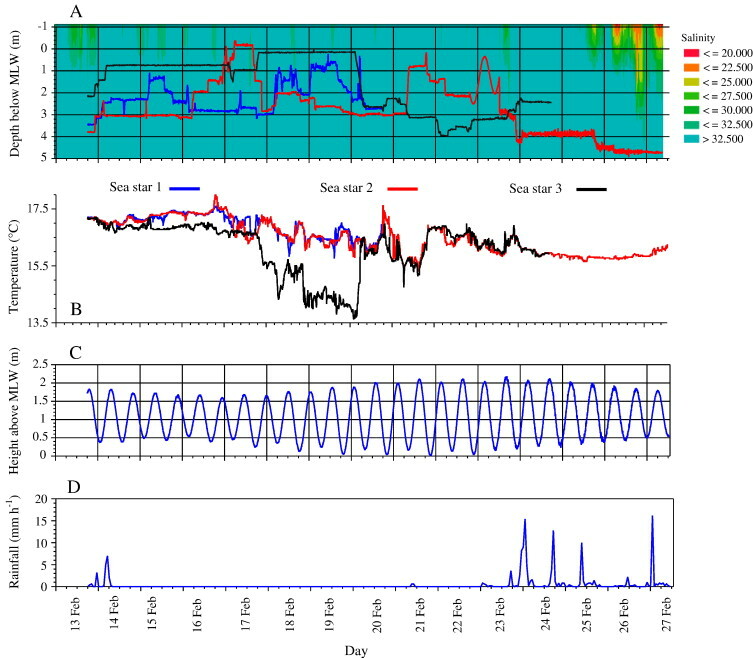 Figure 6 below charts the position of each of THREE individuals relative to salinity, temperature, height above the "mussel line" and the amount of rainfall (on the bottom) versus the day during a two week period. NOTE in the top "blue" box and the bottom box. 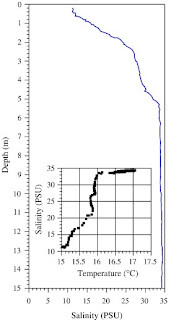 The depth inhabited by the animals DECREASES when rainfall is highest (i.e., the dilution of salinity is lowest). So, as a physical influence, the salt water layer influences how C. muricata forages for food! An influence that is apparently very significant to the animal's biology.. 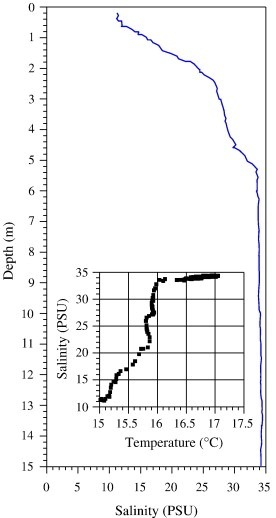 The authors note something of particular interest... that the animals begin their descent BEFORE the deepening/formation of the low-salinity water layer!! This suggests that there are other physical cues (e.g., changes in wave action) to the animal, so that so that it KNOWS when to move! This is kind of neat, because these are the KINDS of cues that are not obvious to us. Asteroids have a very different world of perception. It turns out the aforementioned speed is also an important factor in understanding how the salinity motivates the animal's movement. The speed of the animal..observed as between 1.78 and 23 meters/hour is faster than the rate at which the low salinity layer deepens during the weather!! In other words- the starfish can outrace the "low salt" layer as it approaches! I think most people interpret movement as a function of something observable-like predation. But in this case-maybe not so much? Undoubtedly, the authors probably have more (or could have more) than this-but the paper's intent was mainly to see what they could learn using these new tags. Foraging behavior for an animal like this is important to marine ecologists. You can't exactly follow a starfish like a panther or a racoon. 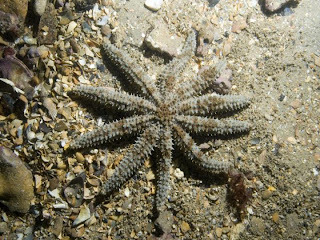 And if our recognition of Pisaster (same family as Coscinasterias by the way..) as a keystone species is considered important to ecology-then understanding things like foraging patterns is also potentially significant to what's going on in marine ecosystems. 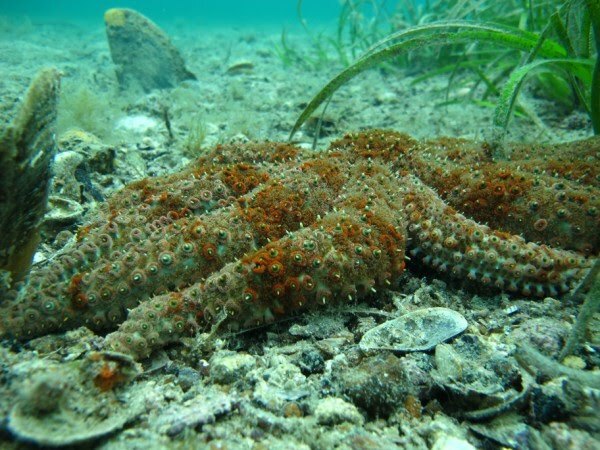 And just on a pure curiosity level wouldn't YOU like to know the secret lives of starfish? Just wanted to say how much I enjoy your blog. Absolutely fascinating and entertainingly written!